Born in the New York of 1843, publishing his first story during the American Civil War, and dying in London in 1916 during World War I, Henry James in his writing career offers an extraordinary account of the literary and cultural preoccupations of his period. His body of fiction, drawing on several literary traditions - notably those of America, Britain and France - registers in its often startling variations and experiments changing relations between literature and society, shifting conditions of publishing and authorship, and an increasingly sophisticated awareness of the critical and theoretical dimensions of modern narrative. 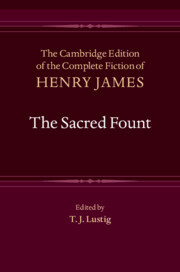 The Cambridge Edition of the Complete Fiction of Henry James is the first full scholarly edition of his novels and tales. Based on first book editions, it offers an opportunity to observe at close hand his development as a writer, while providing authoritative texts, substantial introductions, a comprehensive listing of textual variants, and illuminating annotation.